“Giving Shelter” Exhibit & Cocktail Reception @ Herman Miller Showroom, 5:30 pm to 9:30 pm. $50 General Admission. Tickets available via Eventbrite. Vegan fare, open bar, free parking. 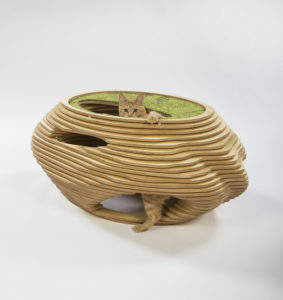 Top LA architecture and design firms and individual architects and designers are invited to design creative and functional outdoor dwellings for cats. The shelters are then displayed during a cocktail reception. Also on display — more than two dozen one-of-a-kind cat food bowls decorated by celebrities, including Jay Leno, Jackson Galaxy, Beau Bridges, Clint Eastwood and Tricia Helfer, which will be available for purchase via an online auction.